The Triumph TR2 went on sale on 1953, the first in a long line of successful sports cars built by Triumph. Its chassis was based on the pre Second World War Standard Flying Nine and the bodywork was styled by designer Walter Belgrove. The TR2 was Triumph’s first 100mph sports car, and was also the cheapest available at the time from any manufacturer with the ability to reach that speed. 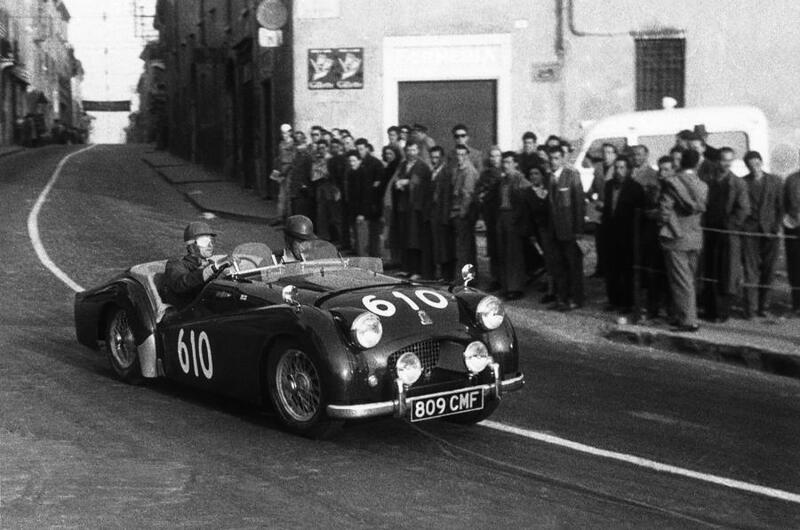 The TR2 became popular for racing and between 1954 and 1955 it was campaigned in the Mille Miglia, the Ulster TT at Dunrod, the Grand Prix of Macao, Lockbourne Races (USA), the Alpine, Monte Carlo, RAC, Thousand Island (Canada0, Leige-Rome_Leige, Nigeria 24-hour, Circuit of Ireland, Soleil-Cannes, RSAC and Tulip ralliers among others. It earned numerous outright, team and class awards including the coveted Coupe des Alpes. In 1955, a Triumph works team of 3 modified TR2’s (including disc brakes and larger carburetors) entered in the 24hour Le Mans. They reached speeds of up to 120mph and completed the legendary endurance race in 14th, 15th and 19th positions. Some of the modifications subsequently appeared in the TR3. 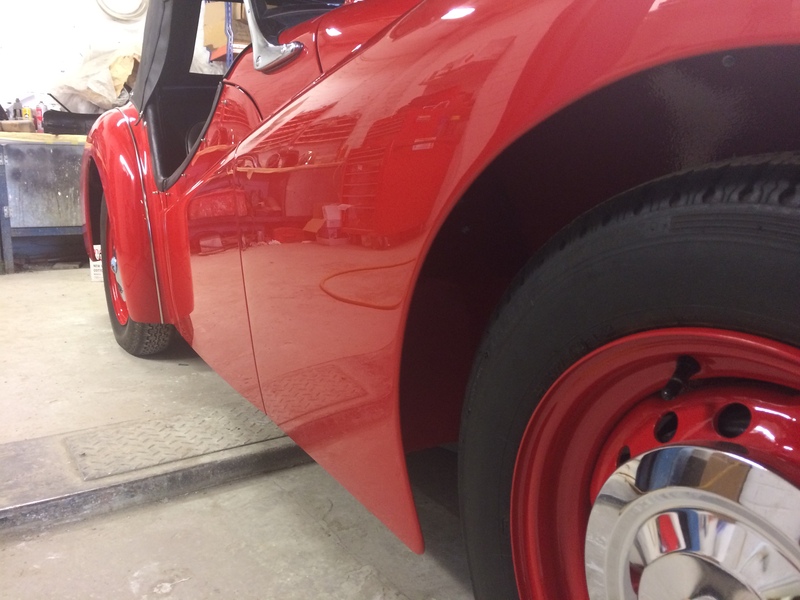 This car has been subject to a full nut and bolt restoration. The car was stripped of all parts, down to the bare body shell. The shell was lifted off the chassis and sent for soda blasting to remove all previous paint and corrosion. The result was a very poorly shell that had been subject to years of shoddy repairs – most of which had been carried out with a pop rivet gun. After trawling through parts catalogues to find and order the panels required, it became apparent that although many suppliers list parts, lots of them are no longer available to purchase. Many of the parts we required were fabricated from scratch. These included all four wings, the boot floor and many other outer sections and panels. Every single panel on the TR2 was either replaced or repaired in some way. This resulted in a nearly new body shell that was aligned and panel gapped way better than it would have been from the factory in 1953. The shell was then completely shaped, primed, sealed and painted in its original Signal Red. The colour was matched to an original piece of bodywork found under the dashboard that had never been subject to direct sunlight. Once painted the shell was completely rewired with a new harness. After re-wiring the car was built back up using as many of the salvageable original parts as possible. Both seat frames were repaired and retrimmed. 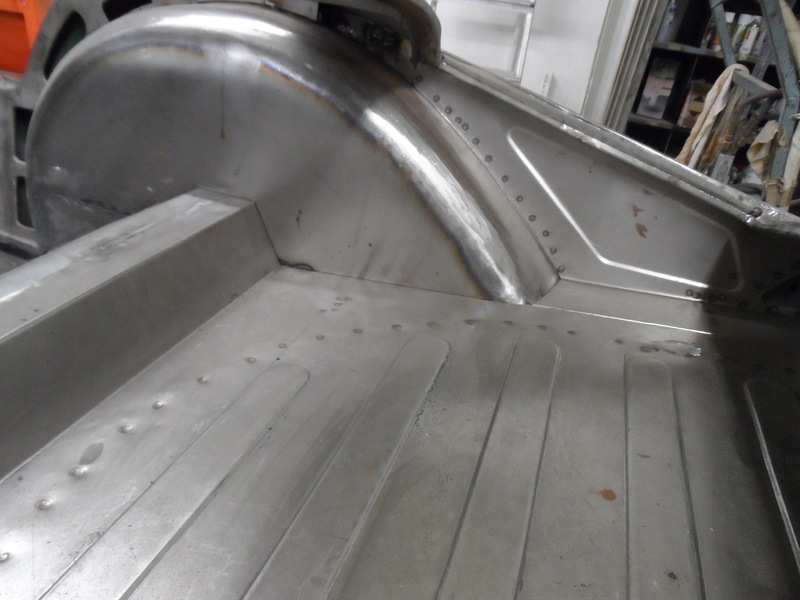 The hood frame was sand blasted to remove corrosion, repainted and treated to a new hood. 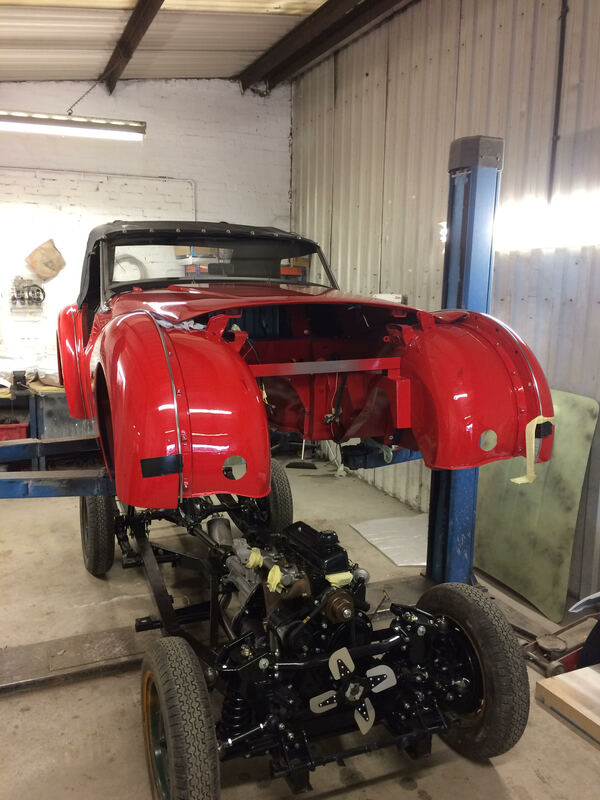 Many components such as the original horns and wiper motor assembly were stripped, repaired and rebuilt before being fitted back onto the newly restored body shell. In the meantime the chassis had been away for blasting, minor repairs and powder coating. 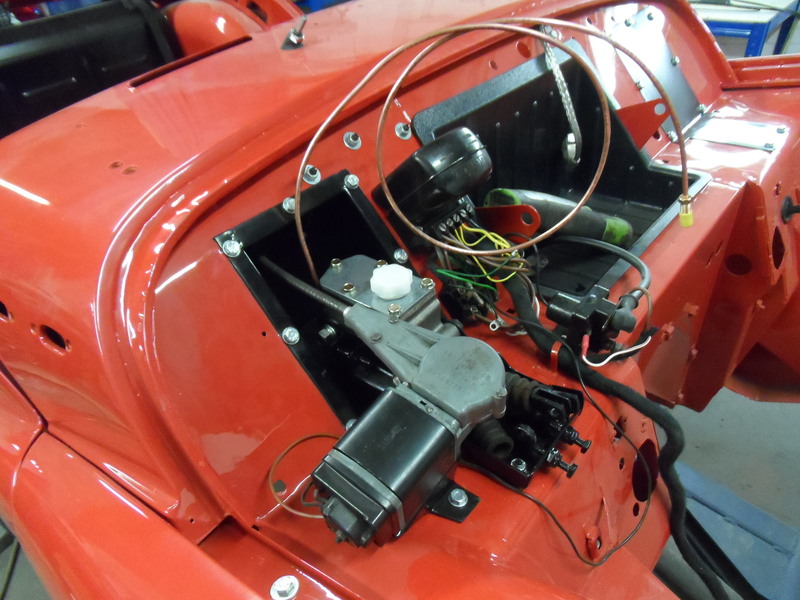 All running gear and mechanical parts were rebuilt to original specification by a well known Triumph specialist. The shell was then reunited with the completely built rolling chassis, connections were made and fully commissioned. 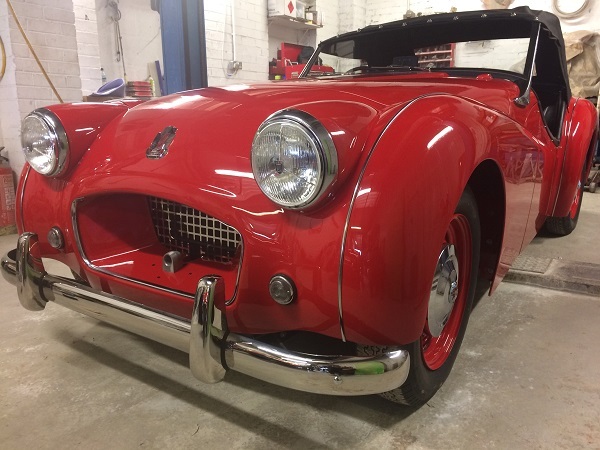 The car, now fully finished, is one of the finest examples of a restored TR2 in the UK and possibly the World. We are here to help, so why not get in touch, even if it is for some free advice.